The movie may be better than the book. 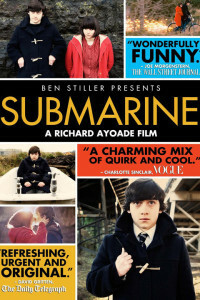 Submarine is the story of Oliver Tate, a Welsh teenager who just wants to bully kids to fit in and sleep with the girl who fell into being his girlfriend and save his parents’ marriage. His quirkiness is what makes him sympathetic (although movie Oliver is more endearing than book Oliver), and you can’t help but enjoy his own personal logic. A fun, if somewhat rambling, read. The kid in The Curious Incident of the Dog in the Night, Christopher, is also quirky and British. And he too is trying to puzzle out his parents’ marriage. But Christopher is quirky because he’s on the spectrum. Haddon does a brilliant job of portraying the MC’s thoughts and logic, even when there isn’t any, and you can’t help but root for Christopher and where his logic takes him. I know nothing about Fabrice Mauss‘s quirkiness. And he’s French, not British. I found him a few years ago while clicking on related videos on YouTube. But his sound and lyrics fit with the weird British kids.